NEW ORLEANS –Outside of Arkansas, who managed to hold onto the top spot in the newest batch of NCAA Division I Women’s Outdoor Track & Field National Team Rankings, the entire top-10 went through a seismic shift over the course of the last week. 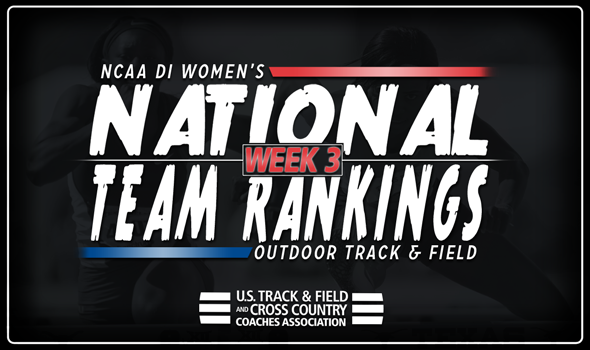 Five teams moved up in the top-10, with three making pushes into the top-five, in the final week of rankings where preseason marks count in all events, announced the U.S. Track & Field and Cross Country Coaches Association (USTFCCCA). LSU and Texas A&M saw the most significant jumps in the rankings, both moving up three spots to second and third, respectively. Competing at the Miami Hurricane Collegiate Invitational, the Tigers saw Ersula Farrow post the third-best 800 time in the nation this year at 2:03.66, while the squad’s 4×400 relay team ran the ninth-best time on the NCAA Division I Descending Order List at 3:33.91. Texas A&M watched Jazmine Fray hit the nation’s top time in the 800 this year at 2:01.18 at the Rafer Johnson & Jackie Joyner-Kersee Invitational. The Aggies’ Lajarvia Brown also recorded the second-best triple jump mark in NCAA Division I this year at 13.58m (44-6¾). Kentucky joined its SEC counterparts in the top-five with a two-spot jump to fifth. Freshman phenom Sydney McLaughlin ran a wind-aided 11.07 in the 100 at the Tennessee Relays, good for seventh on the Descending Order List this year. Arkansas did just enough at the John McDonnell Invitational to hold onto first place for the fourth-consecutive week. Oregon rounded out the top-five with a two-spot drop to fourth. Outside of the top-five, Florida and Stanford made positive strides in the rankings within the top-10. The Gators’ field-event athletes led the way at the UF Tom Jones Memorial, moving the team up one spot to eighth. Yanis David notched the nation’s third-best triple jump mark at the meet with a jump of 13.57m (44-5¼) into a wicked headwind. Lloydricia Cameron added the nation’s fourth-best shot put mark at 17.66m (57-11¼). The Cardinal returned to its preseason-ranking of 10th after Lena Giger’s shot put mark of 18.09m (59-4¼) at the Triton Invitational. Southern California and Georgia each fell three spots to sixth and seventh, respectively, and Texas rounded out the top-10 with a one-spot fall to ninth.